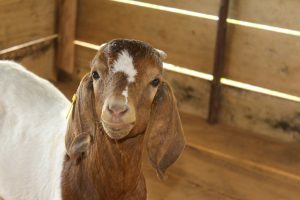 Home » Buy a goat! At Kathy’s Centre in Mayuge, Easern Uganda, Act4Africa has set up their first model goat farm. The farm enables us to train the local community in best practice for animal husbandry and basic veterinary skills. The small breeding herd will also provides an income for the centre in the future. 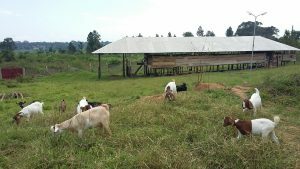 Additionally, goats form a vital part of our HEAL (Health, Empowerment and Livelihood) programme in Mayuge District. 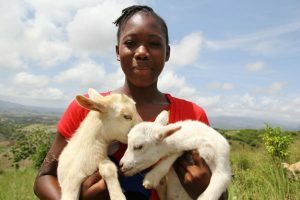 Young women and girls, who have received enterprise training and begun saving with their HEAL group, are given goats to breed themselves. Such enterprises provide the women and girls with access to their own income, enabling them to support themselves and their families. If you would like to purchase a goat to help develop our herd, please donate £115 here. For an extra £15 you can even give it name! So far our herd includes Roxy, Cilla, Mabel, Myra, Bluebell, Tilly, Chris, Kay, and our buck, Goaty-McGoat Face! Built on a 3-acre plot close to Mayuge Town, South Eastern Uganda, Kathy’s Centre provides the community, including vulnerable women and children of the district, with vital health and support services, pre-school education, a youth club and agricultural, enterprise and financial literacy training. The Centre opened in September 2017 and we are still fundraising to resource the centre, including pre-school educational resources, furniture, audio-visual and IT equipment. Any contributions are gratefully received and 90p in every £1 is put to immediate good use! Donations to Kathy’s Fund can be made here.